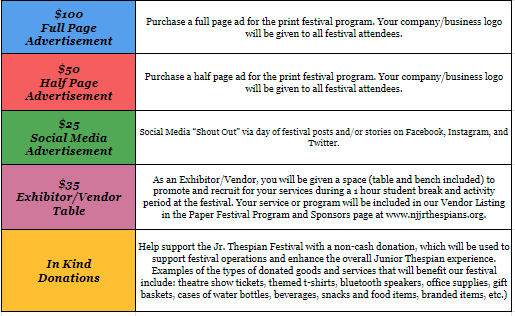 We are currently seeking sponsors for our Junior Thespian Festival 2019. By giving to NJ Jr. Thespians, you will be supporting the International Thespian Society, and helping us educate middle school theatre students across the state. Any donation is appreciated and will be recognized at our event in a special way. If you would like to learn more about the sponsorship opportunities, please take a look at the 2019 Sponsorship Kit and opportunities below. 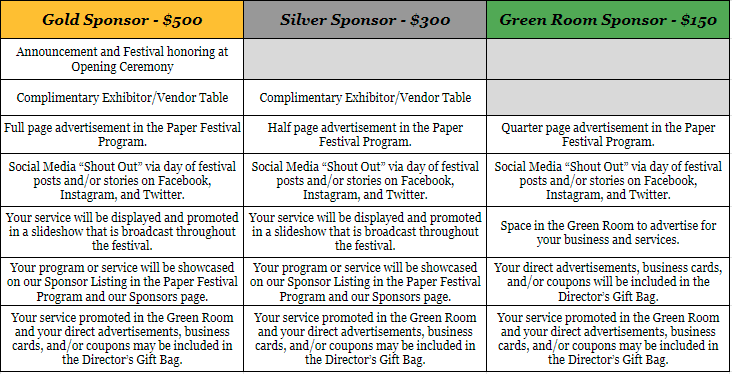 Your service promoted in the Green Room and your direct advertisements, business cards, and/or coupons would be included in the Director’s Gift Bag. Space in the Green Room to advertise for your business and services. Your direct advertisements, business cards, and/or coupons would be included in the Director’s Gift Bag. 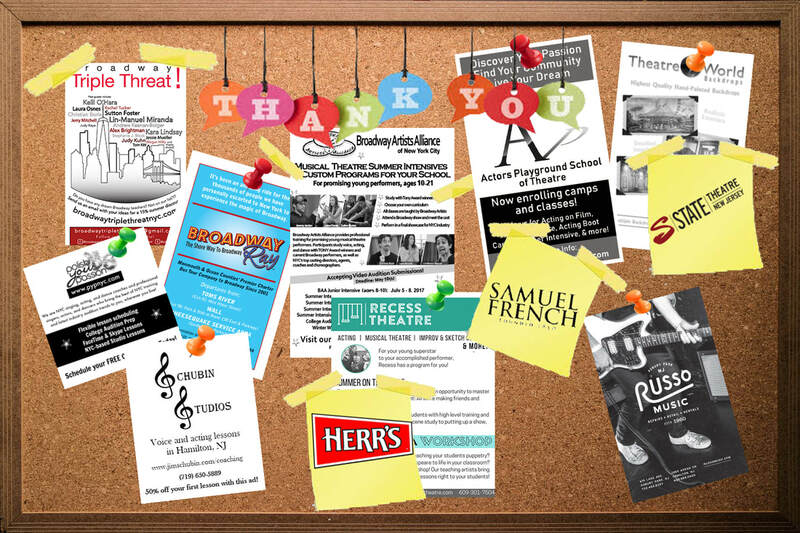 $25 - Social Media “Shout Out”— have your business or services promoted on the New Jersey Junior Thespians Facebook, Instagram, and Twitter pages via our festival posts and/or stories. Your direct advertisements, business cards, and/or coupons will be included in the Director’s Gift Bag. to Lillianne P. Torrente at sponsors.njjrthes@gmail.com by April 30, 2019. What are the specifications for print and web ads? -Ads must be in print/press ready format. Preferred format is PDF with all fonts imbedded. Minimum for images or jpegs - 300 dpi at 100%. Lower resolution images may not reproduce properly and image quality will be compromised. NJ Junior Thespians accepts only static JPEG and PNG files. Animated files are not currently supported. wHAT ARE THE SPONSORSHIP DEADLINES? Deadline to send letters or emails of interest to be a sponsor to sponsors.njjrthes@gmail.com. and/or Deadline to fill out Sponsorship Form. festival. Checks must be mailed and received to NJ Thespian Treasurer. If ads are not received by this date, they will not be printed in the Festival Program. Day of festival. If attending, ad space in the cafeteria or Green Room will be provided. If not attending, programs will be given to all attendees. Logos will be linked to www.njjrthespian.org, and all sponsorship perks will be met.